Discussion in 'iPhone and iPad Games' started by PeteOzzy, Feb 19, 2015. Control the characters in real time and satisfy the mission requirements. However, if things should turn out more difficult than expected, Janitor Joseph has a few tricks up his sleeve  he has a bone to pick with the principle and is teaming up with the most talented cheaters in the school with the goal of helping the students who need their services. Cheats 4 Hire  the new puzzle game from the multiple award-winning developer Travian Games! 	Accessible gameplay  Control your three cheats in real time while taking advantage of and combining their individual skills, as teamwork will be essential for success. 	Exciting missions  As in real life, missions can be completed with varying degrees of success. Repeat missions as often as you wish to obtain the best possible grade. 	Team management  Manage your team, improve existing skills, and level up in order to learn new skills. 	Resources  Use resources to create powerful gadgets that add to the fun. 	Manage your club room  Expand your club room and unlock achievements in order to obtain special items that you can display in your club room. 	Dynamic plot  Keep a close watch over your team's movements as they uncover the principal's dark plans. The outcome of the story depends on your skills and results. 	Episodes  Cheats 4 Hire will be released in 5 different episodes. Each episode picks up where the last one left off and presents you with new challenges. Put your cheating skills to the test and become a hero to your class! 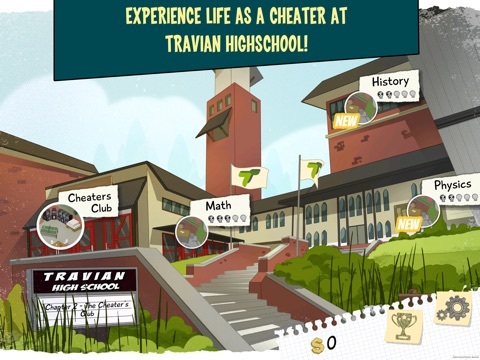 An increasing number of students are hopelessly flunking the exams at Travian High School. The only solution: cheating! 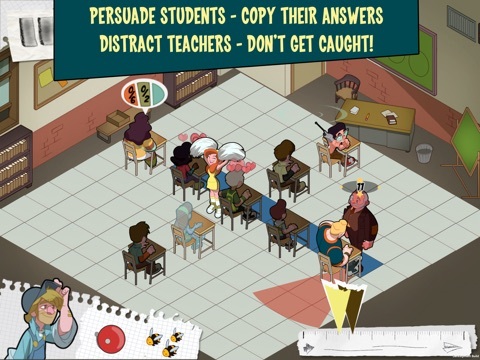 With the help of the cheerleader, convince other as yet undecided students to aid you in your endeavors: Copy and distribute the answers with the nerd's help, and make use of the jock's skills to mislead both teachers and teacher's pets. Control the characters in real time and satisfy the mission requirements. However, if things should turn out more difficult than expected, Janitor Joseph has a few tricks up his sleeve — he has a bone to pick with the principle and is teaming up with the most talented cheaters in the school with the goal of helping the students who need their services. 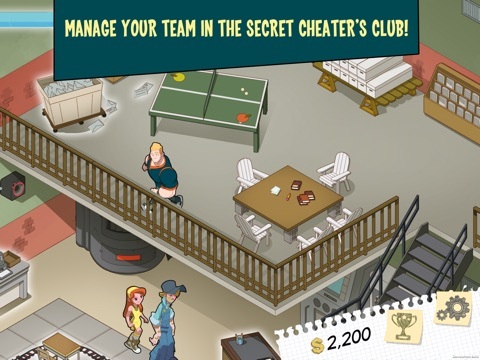 Use the secret club room to improve your cheating skills and learn new ones. Make use of available resources to produce powerful gadgets that will give you an even greater edge and show your friends on Facebook and other social networks who the king of all cheats is. Cheats 4 Hire — the new puzzle game from the multiple award-winning developer Travian Games! 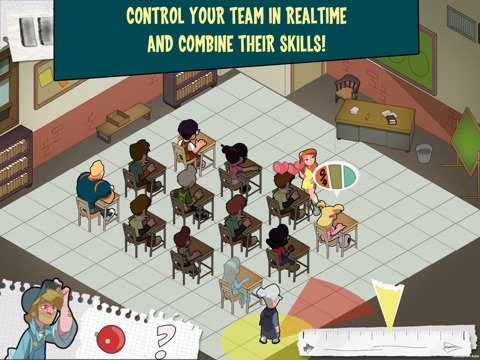 Features: •	Accessible gameplay — Control your three cheats in real time while taking advantage of and combining their individual skills, as teamwork will be essential for success. •	Exciting missions — As in real life, missions can be completed with varying degrees of success. Repeat missions as often as you wish to obtain the best possible grade. •	Team management — Manage your team, improve existing skills, and level up in order to learn new skills. •	Resources — Use resources to create powerful gadgets that add to the fun. •	Manage your club room — Expand your club room and unlock achievements in order to obtain special items that you can display in your club room. •	Dynamic plot — Keep a close watch over your team's movements as they uncover the principal's dark plans. The outcome of the story depends on your skills and results. •	Episodes — Cheats 4 Hire will be released in 5 different episodes. Each episode picks up where the last one left off and presents you with new challenges. Follow us on https://twitter.com/cheats4hire Find us on https://www.facebook.com/Cheats4Hire Discover us on https://www.pinterest.com/Cheats4Hire/ Blog – http://blog.cheats4hire.com/ Cheats4Hire can be downloaded and installed for free. However, some features/episodes in the game can also be bought for real money. If you don't want to use this feature, please deactivate in-app purchases in the settings of your device. You also require a network connection.